Two lovely examples of Chinese export porcelain in the Blue Fitzhugh pattern. The small oval platter one measuring 7 1/4 x 10 1/8″, the more rectangular form oval measuring 7 7/8″ x 9 7/8″. Both in very good condition and dating to circa 1800-1820. Priced individually at $450.00.  Two fine examples of early 19th century Chinese export porcelain in the Blue Fitzhugh pattern. The oval one measuring 10″ x 12 3/4″; the more rectangular oval one 10 3/4″ x 13″. Both in very good condition and dating to circa 1800-1820. Priced individually, the smaller one $550.00, the larger one $750.00. A fine Chinese export porcelain Transitional period garlic necked vase of unusually large size, decorated in underglaze blue with scenes of scholars and their attendants within a landscape. Measuring an impressive 16 1/2″ tall, and in remarkably good condition. Circa 1640. A fine Chinese export porcelain covered tureen of rare and impressive size with a molded and shaped bombe form and robustly scrolling handles, decorated in underglaze blue with classic Chinese landscape scenes, the conforming cover with vignettes of flowering branches, all surmounted by a flower bouquet formed knop. Measuring 10″ x 19″ x 11″. A small curved line to the bottom interior edge, and some very minor glaze fritting along the edge of the cover, otherwise a beautiful and impressive centerpiece for any table or sideboard. Circa 1770-1780. A superlative Chinese export porcelain molded saucer dish with a barbed edge, thinly potted, richly glazed, decorated in underglaze blue and centered with a classic Chinese landscape deftly brushed in the “Master of the Rocks” style. The lotus border, in contrast to the spontaneously brushed landscape, is a careful study in meticulous rendering, the lotus theme repeating on the molded panels on the reverse side and surrounding a centered six-character mark. Measuring 8″ in diameter and, other than a few rim frits filled, in great condition. Kangxi period, circa 1690.